Join the discussion on our forums! 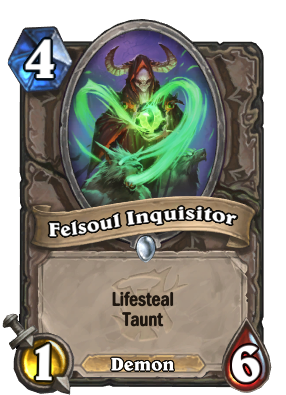 Come discuss Felsoul Inquisitor over in our dedicated Felsoul Inquisitor discussion topic. 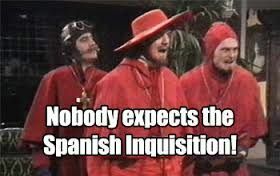 Everyone expects an inquisition reference. I use this card in my Deamon Warlock. Such a great card with Mal‘Ganis! It protects him and heals me for a lot. On it's own, it's not great. Better than Unpowered Steambot for example as it is still slows the game down against aggro but it is better against Paladins or any other class that uses 1-health minions as it can sometimes kill something while getting a bit of health back. I use it with Lady in White Dragon Priest and it has already won me a bunch of games. If it gets played before the Lady, it is still a great target for Inner Fire and health buffs or a comb with Cobalt Scalebane. If it gets played after the Lady and your opponent can only clear it by attacking into it, it's a massive health swing that aggro decks generally can't recover from as they typically need to attack it at least twice. I realize it's not good for everybody, but I have been loving this card so far. Worst case if it comes out buffed and your opponent can remove it immediately, then at least they have one less option to use on Wyrmguard! Sad that it turned out to be bad to you, because this is a great anti aggro card if used correctly. I made a budget anti aggro Warlock deck using Felsoul as the core with some stat boosting cards, baits, and many Taunt minions and I can repel most if not all aggro decks. The only thing that can make aggro win is if you have an insanely terrible draw. Heads up, this isn't tagged as a Demon in the Hearthpwn database. It won't show up when you search for Demons. Insanely good Warlock Tech. Play this + Treachery to mess up your opponent's Guldan. Without a doubt a new meta-defining card. This is a DEMON, so it is going to be awesome in warlock! It's not going to be awesome in any class. I think there is a bright future in Felsoul. People say that it's bad because of the starting stats that doesn't add up to Lifesteal well, but stats can be increased, and Lifesteal shines in high Attack minions. Enough Lifesteal can maintain Warlock's health. Sure, it won't be in every tier 1 deck because it's a common card, but at least it does pretty well against aggro decks with some boosting help.